The flying coaster is a unique ride which most people are familiar with. I have some conflicting information regarding manufacturer at the moment by hopefully I will remedy that soon. The only known ride left is listed below. Basically, the ride follows a circular pattern, similar to a Tumble Bug except there is one ramp which the car flies off of into the air. A shock absorbing system allow the car to land softly and spin around for another "launch". A single car holds up to 4 people. 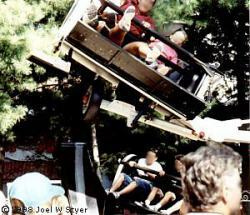 The photo shows the "launch" on the Kangaroo at Kennywood Park. Notice how the car is well above the ramp height.